This web site is a copyright work. The reproduction, copying, downloading, storage, recording, broadcasting, retransmission and distribution of any part of these pages (including all text, compilations, graphics and source code) without the written permission of Michael Stephenson is strictly prohibited. Copyright © 2018 Michael Stephenson. All rights reserved. PRACTICAL DESCRIPTION of the INTERIOR of the NEWCASTLE DISTRICT. As opportunities occur, we intend to submit to such of your readers, as are interested in the topography of this District, a series of observations, descriptive of the wild and romantic Lakes, formed in the northern part of it by river Otonibee, and of the adjacent country. having found it extremely difficult, from contradictory and uncertain information, precisely to ascertain distances and directions, and being in a great measure, destitute of the scientific knowledge about erecting locks and mills, so necessary to a traveller on these lakes and rivers, we present them to the public with diffidence. We felt much pleasure in viewing the scenes, which, perhaps with too much presumption, we may attempt to describe; but, should the description contribute to the amusement or information of your readers, we shall think our trouble in committing it to paper amply compensated. To relieve the Government of Emigrants from unnecessary expenses, and to facilitate the settlement of the townships in the rear of Peterborough, the "Communication Road" from that town to Mud Lake, which is at present scarcely passable for Ox teams, would require great improvement. Should extensive emigration continue, a public grant from the Legislature would be requisite to accomplish this desirable object. The next step would be to encourage a warehouse and ferry, or perhaps a village at the termination of the road. Peterborough, which in the course of a few years, has increased so rapidly, and which seems destined to become the queen of the interior part of this District, should feel and interest, and take the lead in every plan to promote the improvement and encourage the settlement of this country. Mud Lake, having no stream for water to purify and sweeten it, stagnates more than any other of the numerous lakes formed by the Otonibee; consequently its shores must be less salubrious. Its channel though obstructed by mud, is deep enough for light steam vessels. Buckhorn Lake, the next in succession, takes its extraordinary name from a large horn of that animal found upon one of its islands. It is of a triangular form, the base of head about five miles in length, resting upon Innismore, and extending due west from the point of the Indian village to Mr. McEwe's point. The southern side of the triangle is formed by the shores of Smith, and the northern by the coast of Harvey. These two sides, the lake gradually narrowing and stretching northeasterly about eight or nine miles, terminate in the channel of the Otonibee. This lake abounds, particularly near the head of it, with islands of all shapes and dimensions: from some of only a few square yards in area, to others of two or three miles in length, with numerous and thriving beds or fields of rice; with the fish common to all these lakes, the masqinongee, the bass and the hardy eel tenacious of life; and in the spring and fall, with vast flocks of ducks. Notwithstanding the obstructions of islands and rice beds, it has three fine channels for small craft; the southern, which follows or winds down the shores of Smith; the middle, which corresponds to its name; and the northern, which coasts down the front or south side of Harvey. These channels, as the lake contracts and emerges from islands and rice beds, unite about three miles down, and form a wide and open channel to the foot of it. On account of the multitude of islands and fields of rice, they are intricate and difficult to find. For this reason, a stranger, whose business or curiosity may lead him to traverse this lake, should hire an Indian at the village as a guide. About half way down, in the mouth of the lake, is the landing of Harvey; whence a road leads, for about three miles, to a fine shallow lake in the interior of that township, called Sandy lake. Taking your departure from the Indian village, steering westward nearly a mile, through a capacious and steep channel, and entering Buckhorn lake, you have the southern channel on your right. Holding a westerly course for about a mile and a half further and entering a square bay, you discover the middle channel at the northeast angle of it. --Shaping your course still westerly towards McEwe's point, now in sight, and arriving near it, you have, by wheeling to the right, your choice of the northern channel. But, should Pigeon Lake be the object of your search, steer around McEwe's point for about a mile through another wide and deep channel, and you will discover it expanding before you. Then a north by west course through this lake, for seven miles, toward a bay, from which the shore bends to the northeast, will conduct you to the mouth or inlet of the Otonibee. A person, who has been entangled, bewildered, and fatigued among the beds of rice and of mud, which meet his eye at every turning and winding of Rice, Mud and Buckhorn lakes, will hail with pleasure this fine expanse of water; which from the absence of these nuisances, is the clearest and most beautiful of the four. Pigeon Lake, so called from an ancient Indian of that name, who made it his favourite resort for fishing and hunting, stretches due north for about four or five miles; then forming a large and lofty island, the eastern shore takes a circular sweep towards the middle of Harvey. The west side, running likewise due north for about seven miles, receives the waters of the Otonibee from the west; then verging towards the east, forming a large bay, receiving two considerable streams, which are said to have mill sites, and crossing six concessions of Harvey, it forms a junction with the other side at the mouth of the Squaw river, which is reported to be navigable for about a mile to a fine mill site. The eastern shore of this lake, which presents, for about four or five miles, a continued fine landing, becomes afterwards bold and rocky. Its southwest angle receives Pigeon creek, which, heading in Manvers, and flowing through Emily and Innismore, is navigable through a very winding channel, for about eighteen miles from its mouth. This lake contains some small islands very picturesque; one of which resembles a small vessel under sail. Its shores near the mouth of the Otonibee are rocky and romantic; being formed of large slabs of limestone, rising layer above layer of unequal thickness to the surface, and forming an inexhaustible quarry. Entering the mouth of the Otonibee, and proceeding about half a mile to the First Falls, you find that the river, by deepening its bed, presents a greater number of strata of the finest limestone; and that, by undermining its banks, it has detached from them a vast quantity of the most beautiful stones for building, of various thickness and dimensions, which might be slid with great care into a scow, and transported to any part of these three lakes. 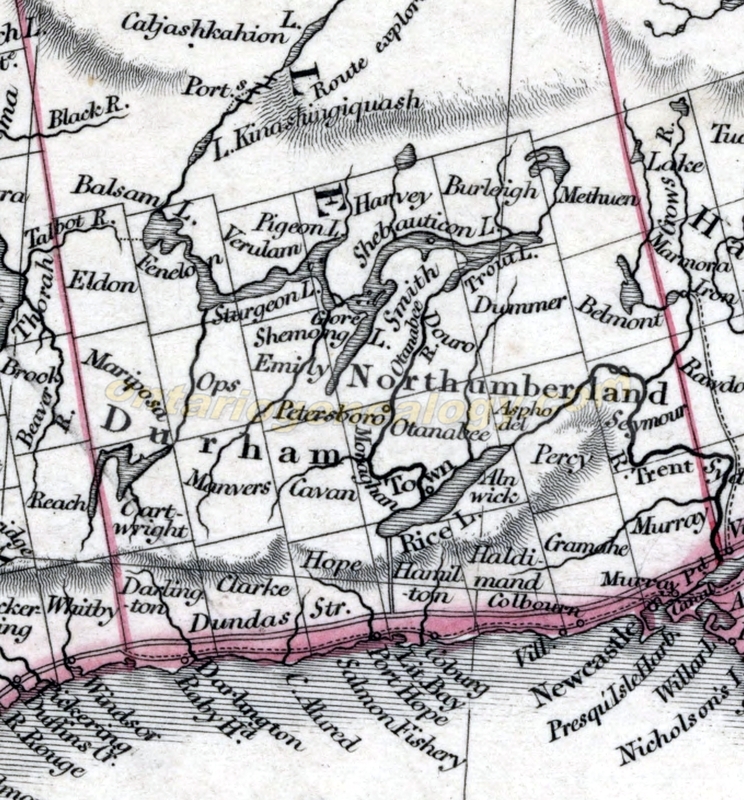 Such indeed seems to be the extent and depth of the vast masses of limestone, which appear near the surface, that, should the feudal system ever prevail in this part of Canada, the future barons will be at no loss for materials wherewith to erect their castles. The falls are about six or eight rods wide and five or six feet high; the river flowing over a bed of limestone. In the spring, from the rising of the lake below, they are scarcely perceptible. The Indians ascend and descend them at times in their canoes; and a scow has even been forced over them. They might be surmounted by an eight foot lock, a dam of two feet to raise the stream above, an undertaking which, as abundance of the finest materials have been quarried by the river immediately below, might be accomplished at a small expense, probably six or eight hundred dollars, and which would lay open the steam-boat navigation of eighteen horse power, and two or three feet of water, the whole country, extending from Mud lake landing near Peterborough and the falls in Harvey, to the head of Sturgeon lake; and thence to the southern part of Scugog lake in the township of Cartwright. At present, the navigation is confined to scows and smaller vessels, and limited to the following extent, reckoning from the landing at Mud lake six miles from Peterborough, To the first rapids below Buckhorn lake 17 miles; to the western falls and thence to the eastern point of Pigeon lake, 25 miles; to Emily by the circuitous route of the lakes and the winding channel of Pigeon creek, 30 miles. A mill might be erected at these Falls, but it is probable, that from the rising of Pigeon Lake below, she would be rendered useless, by black water, for a length of time every spring. Having already mentioned that the rivers flowing into these lakes are said to abound with mill sites, some of which are open to navigation; we may now add that their banks and shores are clothed with pines, which if they be suitable for such purposes, will afford an inexhaustible supply of timber. Much of the pine timber, however, which we observed, was comparatively dwarfish and knotty. Before we quit these lakes, it may not be amiss to mention that their points and islands appear, from numerous remains of Indian antiquities, which have been found and dug up on them, to have been, probably from the abundance of fish and game, favourite haunts of the Indians. Fragments, and even whole pieces of pottery tastefully ornamented, and heads of darts and arrows made of flint, have been discovered, some of them buried in gravel, at the depth of one and a half and even two feet below the surface. The latter are unquestionably Indian antiquities; their claim to the former (the pottery,) as the French, the first European possessors of these extensive counties, had trading posts from the mouth of the St.Lawrence to that of the Mississippi may be disputed. Bones and other remains of the Moose-Deer, the largest of this genus, and which seems now extinct have also been found. Wishing to examine the river Otonibee from the outlet of Buckhorn to Stony lake, we engaged Jacob Iron, and Indian of a hardy name, and a boy; the former the son of the chief, a skilful and able pilot and a good shot; but (what seemed his only defect) no great proficiency in the English language; the latter silent and motionless, except when a rice bed or a flock of ducks appeared; when he suddenly became animated and loquacious, gave the earliest notice of a shot, levelled his paddle, and made facetious remarks upon shooting. We reached the foot of Buckhorn lake about eight o'clock, and proceeded to the first rapid, about three miles below. Here the main rapid is strong and abrupt, we landed and walked along a portage of one or two hundred yards; whilst the Indians, taking a circuitous route, and going down a smaller and less dangerous branch, soon arrived at the other side. These rapids, being mostly formed and divided by mossy rocks of granite or rocky islands, which the impetuosity of the stream has neither been able to shake or wear away, commonly have a main stream, and one or two smaller ones. At this rapid, taking the rapid properly so called, and a current of a few hundred yards into consideration, the whole descent may be about ten or twelve feet. The north side is formed by a great, but low rock of granite, which shoots at right angles with the river into Harvey, and will if permitted form an everlasting barrier, and defy all the efforts or the river. This rapid is about five or six rods in breadth. Again embarking, we proceeded to the second rapid, about half a mile below the first. Here the Indian prepared to descend; and as we had resolved to commit our safety, during this short excursion, entirely to his experience and ability, we started no objection. An Indian is commonly dull and lifeless. But, when roused by the appearance of a rapid, or in pursuit of his game, he suddenly shakes off apathy, and becomes animated and excited; preserving however coolness and presence of mind, the two great requisites in every danger. In such cases his motions are rapid, decisive and energetic; and of his canoe and his gun; his two constant companions, he seems, whether standing, sitting, leaning upon one knee or two, to be equally master. The management of our guide was this: In general the boy occupied the head of the canoe; but when rapids, or shallows beset with rocks appeared, he would suddenly, by two or three dexterous strokes of the paddle, wheel round the canoe, and take the post of skill and danger to himself. Accordingly, having gained, as we said, the second rapid, he ordered the boy to sit down, rose himself, and bringing the canoe round, manoeuvred a little to gain the proper place; then giving her headway, down she went, bouncing and floundering all the way to the foot of the rapids; being warded off the rocks by the most skilful, seasonable, and successful strokes. This rapid is a little broader than the first, more rocky, has a fall of three or four feet, and is secured on the south side by a high and solid rock of granite. A few hundred yard below is a tolerably good site for a bridge, nearly of the span of that of Peterborough, the river been deeper and less rapid, which would connect Harvey and Smith: whence a good road, it is said, could be made to Pearson's and on to Peterborough. An Indian, though a safe pilot, is not the man for expedition; he has never been accustomed to it. --He must edge along rice beds, or pull through marches in search of ducks. Moving along the side of a rice bed, a flock of ducks approached. the boy, whose eye nothing could escape, gave the signal; away flew the swift messengers, and down came three duck, one killed and two wounded. Then began the scramble, the canoe, neglecting the dead, flew like an arrow towards the living ones. The first, only winged, dived repeatedly; but was at last struck with the paddle and taken in. the second, having had time to collect her scattered spirits, and adjust her plumage, took wing and escaped. About ten, we crossed the foot of Deer bay, a square piece of water stretching south about a mile and a half, by a mile in breadth; and surrounded by a lofty and dark ridge of pines. The third rapid, having likewise about three or four feet of fall, we descended nearly in the same manner as the second. It appears to be wider than the two former and less rocky. Having arrived at the last two about noon, we carried a short distance past each in succession. These may be dignified by the name of Falls; the former having about eight feet descent, the latter twelve. This forms the most picturesque and romantic part of the river. The last potage lies over the north side of an island, formed of immense rocks of granite. Whilst the Indians were carrying, we rambled about, and gaining the summit of a rocky eminence towards the south, we appeared to be standing a hundred feet above the level of the water, upon a vast and compact mass of rocks, which even an earthquake could hardly shake. The whole river, at the last fall of rapids, being confined by rocks to the breadth of a few yards, roars furiously down a precipitous descent, boiling and forming many eddies below. In the spring when an immense volume of water pours down, the scenery of these falls must be grand. Here two lovers, such as Inkle and Varico in the Spectator, might, "locked in each other’s arms, sleep in full security amid the fall of waters," but not, "amid the melody of nightingales." View taken below the second and last rapids, particularly in the month of June, would form pretty good subjects for the pencil of a landscape painter. Having eaten our dinner upon a rocky table, we again made sail, proceeded to a part of Stony, or more properly, Rocky lake, and down the Otonibee to the head of Clear lake; where, being at length satiated with the view of rocks and rocky islands, and apprehensive of having to pass the night upon a naked and inhospitable rock, we put about to return. The very thoughts of spending the night upon a barren rock, amid this wild, dreary and frightful solitude, would shake the feeble nerves of a Parisian bean or of a London dandy. This feat, however, was performed by a person who has been of more uses to his species than a thousand of such worthless bipeds. This gentleman, unexpectedly overtaken by night in Stony Lake, pushed for the nearest rock, which happened to be a naked one. Having chosen the smoothest lair that this inhospitable abode afforded, he drew up his canoe after him, stationed to windward to shelter him from the cold blasts, and stretching himself out, passed the night, if not comfortably, at least without a murmur. Arrived at the last falls, we now carried past both at once, by a portage entangled with brush, of about twenty or thirty chains. Here we might point out a trait in the character of the Indians. Such has been and perhaps is, their aversion to labour and improvement; that, though from a path worn even over the rocks, and the remains of fires, fish and fowls, it is evident that they often frequent these portages, yet we could not perceive a single piece of brush cut, or a log thrown out of the way. Rather than make this easy and comfortable improvement, they force their way with heavy canoes, through thickets of under wood. As this portage was long, the Indian tied the two paddles across the two middle thwarts of the canoe, leaving room for the introduction of his head; then, wrapping a blanket round his shoulders, and going under the load (a canoe sufficient to carry five men), the movables secured in a blanket falling to the boy's share, we set out at a quick pace, through an intricate and brushy path; the Indian, now and then, leaning the head of his canoe on the ground to rest. Having reached the third rapid, we got out to walk across, whilst the Indians ascended in the canoe. The first part of the ascent seemed easy--but the canoe, having gained the strongest part of the rapid near the head, remained for about a minute, notwithstanding the most rapid and vigorous strokes, nearly stationary; and we were beginning to anticipate a scramble at the foot of the rapid; when the Indian placing the tip of his paddle adroitly and firmly against a rock, decided the contest, and up she went. This game of ascending rapids, even in Indian canoes, seems to be perilous. The snapping of a paddle, or a few strokes unskilfully applied, might give victory to the enemy; and then laughable or even disastrous consequences might ensue. Having again crossed the foot of Deer bay, and night falling fast, our conductor approached the southern shore, from which the wind blew, and began to peep in for a bivouac. At length, going ashore among a grove of cedars, and poking about, he gave us the signal to join him. The place which he had chosen was dry, and sloped about seven feet from the root of a spreading cedar to a backlog. All hands were now employed cutting firewood and breaking cedar boughs for our beds. A blazing fire being kindled, our blankets hung up to dry, and two ducks picked and spitted, we sat down to enjoy ourselves. Supper, conversation about hunting excursions, and repose succeeded in their turn. Starting at dawn the next morning and coasting along shore, we passed several rocky piers, which running into the lake, formed two or three good harbours. Three of them appeared surprisingly regular and level; and, as they were not wanted here we wished them at Cobourg. On the point of one of these piers, we descried two otters, taking in a luckless hour, their morning's airing, and made towards them. Nearing the rock, we found that they had exchanged their situation for a frolic in the water. One of them coming around the rock, sometimes darting his small head and long neck out of the water, and again concealing them, was fired at. The shot flew all around him; but being small, took little effect. He again appeared, blowing and sputtering; the, taking a westerly directions towards another ledge of rocks, he was nearly out of site before we could reload and resume pursuit; his consort, meanwhile, making her escape with all speed across the lake toward the north. We gave chase to the former, and coming up with him just as he had reached and was beginning to ascend the rocks, he received another shot and came down. The Indian made some desperate strokes at him with the paddle; but as he prudently kept under water, they had no effect. Reloading and firing a third time, the poor animal who had struggled desperately for life, was deprived of it. A council of war was then held whether we should pursue the fugitive, a question which was unanimously decided in he affirmative. The paddles not being spared we came in sight of her before she had gained the opposite shore. Approaching with the utmost caution, she received a shot in the head; which, as she was a female and consequently "the weaker vessel," at once decided her fate. She was, we are sorry to say, big with young. We ascended the second rapid in the same manner as the former; and again carried past the first. We have now described all the rapids and falls, fro the head of Balsam lake in Fenelon, to Clear lake in Dummer or Douro, except one, the greatest and most beautiful in this part of Canada, which we had not an opportunity of visiting. It is said that this fall, situated at the head of Sturgeon lake, is thirty feet high; and that the river, bounding from a projecting ledge of rocks, leaves room, between the falling sheet of water and the base of the rock for a walk. We shall now exhibit a summary of the whole fall fro Balsam to Clear lakes. Errors and false information excepted. The Otonibee is said to be navigable from the head of Clear Lake to Nelson's falls. From the latter to Peterborough (nine miles) it is a continued rapid or current. The whole course of the river, from the foot of Buckhorn to Stony lake, is a succession of small lakes, which vary from half a mile to two miles in breadth, and which are formed by occasional narrows and rapids. The whole of the channel would appear to be good for steamboat navigation; with the exception of sunken rocks, which may render it a little difficult and hazardous. Indeed the greatest part of the channel might receive a steamboat of any magnitude. The whole fall, from the head of Pigeon Lake to Nelson's falls, might possibly be surmounted by five or six eight feet locks. Beginning at the first rapid, abundance of excellent limestone could be procured for the locks in Pigeon Lake, and conveyed, with ease and safety, through a fine channel of only twenty miles. The season of maturity has not yet arrived, but time, a wonderful change-broker, may bring it about. In making such observations as the preceding, we profess and entire ignorance of locking and canalling. We wish merely to state what we have seen; leaving it to more scientific heads to draw conclusions. There is so great a uniformity in the general scenery of the rivers and lakes in this District, that a description of one might almost serve for the whole. A sluggish, and apparently stagnant stream, working its tardy and reluctant course through beds of weeds, rice, and mud, between pine ridges and through swamps; here and there flowing over a smooth bed of limestone, or roaring down a rapid. The barrier which nature has placed to prevent inundation, the "ne plus ultra." the "hitherto shalt thou come and no further," is the never failing pine ridge, bending down or opening here and there to permit the transit of a stream or river with its due portion of "drowned" land, and sloping towards a muddy beach, skirted with cedar, poplar, and other trees which spring out of a marshy soil. However, arriving at the foot of Buckhorn lake a new scene presents itself -- an important, and a sudden transition from a limestone to a granite country meets your view -- and the change excites at first no small degree of surprise and admiration. Where the line of demarcation runs, towards the east and west, between the limestone and granite, is a curious and interesting enquiry. Some of your readers may possibly be able to solve this problem, Towards the east it probably takes a course through the north of Smith, Douro and Dummer; but whither afterwards, we know not. Towards the north its direction appears to be more uncertain. It may go to "Nova Zembla, or the Lord knows where." "It is horrid with rocks"--with rocks of the most solid, durable, and imperishable granite. From Buckhorn Lake to the last rapids, the rocks are comparatively few, thin, and low. Opposite and below Deer bay is a great number of low, rocky islands on the north side of perhaps the worst part of the channel, passing the last rapids, and entering a part of Stoney Lake, you seem lost amid a wilderness of rocks, of various elevations, many rising twenty, and a few even fifty feet above the level of the water. So sudden and great is the change, that, were a person transported hither from a southern part of the country, and placed upon one of these rocks without and previous knowledge of the place, he would be apt to suppose, that some old Indian magician, with a view to build another Stonehenge, Giant's causeway, or Peak of Teneriffe, had, with his potent rod or powerful incantations, summoned together all the rocks fifty miles round; but failing in his attempt, had, during the rage of his disappointment, hurled them from him in the utmost disorder and confusion. Here, however, are no rugged and perpendicular rocks, with their ledges and caverns, to excite a lasting admiration on the mind of the beholder--no projecting cliffs threatening to tumble and overwhelm him. The scene, though wild and romantic, soon cease to phase by their uniformity; and the second and fifth rapids excepted, possess neither beauty nor grandeur. Having seen a few rocks, you have a specimen of the whole; and the vegetables, growing upon one island, you meet with on another. The high, or spring water mark, five or six feet above the present level, is observable on all; and to this height, they are all naked and black. Few of them are conical. In general they are oblong; and the two sides meet at the top, by a roof pitch or slope; sometimes steep, but generally admitting ascent to a good climber. Such as have a steep slope, a smooth surface and few or no fissures, produce no vegetation; the rain washing down every particle capable of producing soil. Others, having less pitch and smoothness, are covered with moss. A few, which we could not sufficiently admire, having seams of fissures running parallel to each other, and equidistant, which catch in its descent, whatever is deposited, and convert it into vegetable mould, are adorned with lines of vegetation, two or three inches high, resembling rows of plants of the same height in a garden. Some of these which are covered with moss on the top, and stand single and solitary, or by twos and threes, if seen at a distance in the dusk of the morning or evening, or through a hazy atmosphere, when vision is indistinct, would, without any assistance from the imagination, delude a stranger with the pleasing but fallacious hope of approaching a human abode; the moss-covered slope, and the dun-coloured rectangle, formed by the spring flood below, assuming the appearance of roofs and walls. One of these, standing singly by the mouth of the creek, had a door neatly formed near the middle of the front, by water oozing through fissures from the top, and spreading into that shape in its descent. And spend their sweetness in the desert air." Among these rocks of granite, especially below the last rapids, vegetation languishes. The trees, like half starved children, are stunted in their growth for want of nourishment. The pines are no longer tall and majestic; the oaks are dwarfish and scrubby/ This observation, extending to all kinds of plants, must be confined to the view from the river. Concurrent testimony, however, gives the country to the north a rocky and barren character. These rocks, as their fractures and fissures appear to be all vertical, belong to that class which Geologists call "primitive rocks." We observed, however, a few, which, from their inclined strata, and their slaty and pliable texture, appear to be of the transition kind, In the stony lake are some salmon, trout; though they are said not to be numerous. Approaching what is called the "Dividing Ridge," which separates the waters or streams of the St. Lawrence or Otonibee from those of the Ottawa or Grand River, the country, as it is stated, rises and becomes more rocky and barren; mountains show themselves here and there; the streams flow more rapidly; the shores of the lakes and islands become more lofty and picturesque; the water more pure and cold, and beds of mud give way to sandy bottoms. Not having been able to accomplish our intention of making and excursion through Sturgeon, Hat and Balsam lakes we refrain, for the present, from saying any thing upon this part of the country. In the banks of a river, however, which flows from Balsam Lake is found a white rock or stone, of which the Indians are said, in ancient times, to have fashioned those clumsy pipes, which are now and then met with. This stone, which can easily be carved or wrought into any shape by a knife or chisel, possesses the rare, and apparently opposite qualities of softness, durability and susceptibility of a fine polish. Some think it might be manufactured into elegant ornaments for houses, & etc. On the banks of a small lake towards the north, has likewise been found a black stone, with which lines can be drawn upon paper or wood. The skilful mineralogist, who could endure the fatigue of clambering among rocks, and wading through swamps in the rear of these lakes, might find amusement, and perhaps useful discoveries. For a country abounding, like the Canada's, with innumerable lakes, with portages form one of them to another; and for tribes of fishers and hunters, whose wants or wishes compel or induce them to make frequent removals, and long excursions; and who must likewise surprise their game by cautious and noiseless approach, there can be no kind of vessel that swims in the water, more admirably adapted than the Indian canoe. From its shape and the smoothness of its surface, it glides through the water, when propelled by a skilful paddler, with surprising velocity; when stealthy slowness and silence are necessary, its motions are scarcely audible or perceptible; when it is requisite to cross a portage, its lightness makes it an easy load, and when a sudden storm or rain takes place, it can be converted into an umbrella or shed. ----- palmam, qui meruit, ferat,"
we have read or heard of no contrivance, either in ancient or modern times, for this important purpose, fit to compete with that of our Indian, In short, the Indian Canoe seems to be a thing formed to obey the wishes and administer to the wants of its owner. The white traveller, too, finds it an easy and most agreeable means of conveyance, Seated in the bottom upon soft brush, covered with a blanket, and reclining against one of the thwarts, he can look around him, or meditate perfectly at his ease. Should he be desirous to ascertain his course, he can keep his compass before him; and, should he be a communicative traveller, he can note down his remarks and observations for the use of his friends; and what is highly agreeable ; he can rely with the utmost confidence upon the skill and ability of his Indian Pilot.